I like comparing pictures over time in similar poses. This isn't exactly the same pose or background but you can see the change in Elisabeth now compared with 5 months ago. Little ones sure do mark the passage of time like nothing else. We took our first camping trip as a family a couple of weeks ago. The kids did great. Bedtime was a little more challenging, but besides that it went well. We went to Morrow Mountain State Park. We did get rained out on Saturday night. Since we were only a couple hours away from home we decided to throw in the towel. It was a bit challenging throwing all the wet things in the car, but we managed. Here's the pictures we took during the trip. I have just finished reading a book that suggests a new more Kingdom oriented way of training up children and from what I read I am convinced enough to try it out. I think I might need to order the CD's or DVD's for a little more "how to" help in dealing with two year olds. I highly recommend this book to anyone who is going to be an authority figure in the life of a child. It is called Loving Our Kids On Purpose by Danny Silk. There is so much good meaty stuff in this book I am struggling to identify a few points to share. The bottom line is that as parents, our goal is to introduce our children to a relationship with God by doing our best to relate to them as He does. If this is our goal, then we are challenged to look at our own hearts and how we respond to our children's misbehavior. We must identify and address what is going on in their hearts and not just change their behavior. And it's no longer about punishment but good and bad choices with consequences. Here are a couple of clips that deal with a some aspects of what is covered in the book. 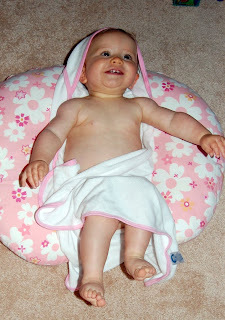 I can't believe Elisabeth is going to be 10 month's old in a few days. Oh, how the time flies. I am really enjoying this stage. I think I'm savoring it more than I did with Jonah because now I know how quickly she will change and I think I'm just more relaxed having gone through this stage with Jonah. Here is a recent video of her talking; you can hear her say something close to "mama" and "dada." You can really see her personality too. This video was taken a few weeks ago when we went to the lake. We thought we would go swimming, but the water was too cold. 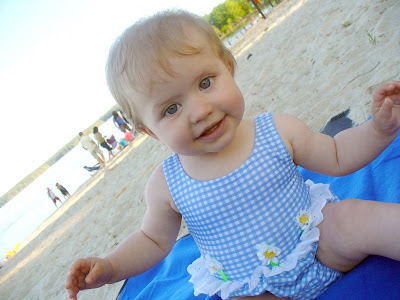 Before we figured that out I had put Miss Elisabeth in her little bathing suit that I bought for 25 cents at a consignment sale. Here is a picture of her posing in her bathing suit. Kelly made me a nice breakfast and gave me a hand molding kit to make a keepsake of the kid's hands. He was going to have it done before giving it to me, but when he saw how complex it was he thought we should do it together. (Not sure a two year old can hold his hand still for a whole minute without lots of help :) We then decided to go to a local put golf and game place. We played a few arcade games - at this stage you don't have to put money in the machines for Jonah. He thinks he's playing when the previews are one. We played a game of golf; Jonah even tried a couple of holes. Then we rode the go carts. Jonah loved this part. Jonah just made the 36" required to ride as passenger. I had a buy one get one free coupon, so Kelly and I took turns chauffeuring Jonah around the track. This probably sounds cheesy, but as I was watching Kelly and Jonah go around the race track, I got all teary eyed. Not sure why. But it reminds me that earlier in the week I was mourning the fact that he isn't a baby anymore (and thinking Elisabeth will not be one very long), but this was a glimpse of all the fun times we can have with him now and as he gets older. Afterwards, we went out to dinner and as I write this we're trying to get Jonah in bed early so we can watch "The Day the Earth Stood Still." Now if we can just get him to stand still. The Best Me Ever! An Astronaut? Jonah surprises me almost daily as he learns to articulate his thoughts. Here are a couple from the week. The other day he picked up a mirror and points to the mirror and says that's Jonah. Then he says, "Look mommy, it's the best me ever." And hugs the mirror tightly to his chest. I'm not sure where he got such great self esteem. I suspect he picked that phrase up from Sesame Street, but I can't say for sure. Lately he has had this obsession with spaceships. He has loved airplanes for some time but spaceships have won out lately. I think it began when we bought the movie "Wall-e" for him. (He also really likes robots now - you should hear his robot impersonation.) So now everything, toy or not, becomes a spaceship that he flies through the house: ink pen, baby rattle, screw driver, etc. A week or so ago we went to a book store. While in the kids section, Jonah gravitates to a children's book about astronauts. We ended up buying it (Luckily it was in the Bargain Section). It is now one of his favorite books. It very simply describes the life of an astronaut. Well, yesterday we're putting his shoes on to get in the car and he tells me quite matter of factly that he wis going to go to astronaut school and repeated that statement a few times throughout the day. Well, my dear, sweet Jonah. Whether you become an Astronaut or not, may you forever be the best you ever!